Networking, breakfast & fun competition with our neighboring chambers! 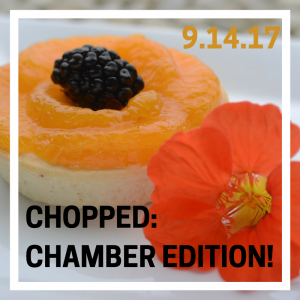 Based on the wildly popular food Network show "Chopped," our teams will compete before a panel of expert judges taking everyday items and turning them into something healthy and extraordinary - but watch out_ what secret ingredient may throw our teams into a tailspin! Teams from the Waterford Area, Lakes Area, and Greater Farmington/Farmington Hills chambers of commerce will compete in a breakfast challenge in the hospitals Demonstration Kitchen. Each team will consist of a chamber board member and a local chef from each community. Lakes Area Chamber of Commerce - Coming soon! Greater Farmington Area Chamber of Commerce - Coming Soon! Master of Ceremonies - Coming Soon! Space is limited to 30 per chamber - Reserve your tickets today! Enter the number of people who will be attending. Select"0" if no members will be attending.